A dozen boat rides, nine flights, eight hotels, five bus rides, and two train trips later - we're back home after two weeks in Peru. Our time spent high up in the Andes after the Amazon was sick. Real sick. Like altitude sickness kind of sick. The first night and morning was gross. After landing in Cuzco, Peru (11,300 feet above sea level - twice that of Denver Colorado), it took a few hours for the headaches to start. They got progressively worse until it was a 24 hour migraine with nausea, loopiness and shortness of breath. It felt like the worst hangover ever and we were worried this was how we'd feel for the rest of our trip. We decided not to pursue a white water trip we had been considering - good choice because the river looked lame as hell in the parts they let tourists raft. It all subsided on the early morning train ride to Machu Picchu, which is 2,000 feet lower than Cuzco. That was enough to let us acclimate to the altitude and we felt fine for the rest of the trip. We just had to get used to the shortness of breath and Lori being loopier than normal. We had two days at Machu Picchu, the first day was bright and sunny and the second was cool and misty. It was great to experience it under both conditions and being able to hang out without the masses of tourists who take the train/bus trip just for the day. We did three different hikes around the site then returned to Cuzco for a couple days on our own. Cuzco is a really cool city, all the buildings are built on 500 year old Inca foundations. The combination of Inca, Spanish and modern architecture is pretty wild and the area is full of tourists from all around the world, with American definitely in the minority. 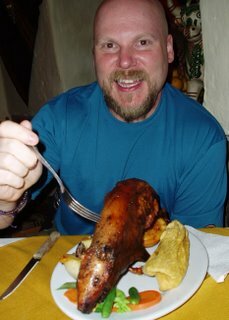 We did find the best Pisco Sours and I even got to dine on a fine roasted guinea pig. Mmm... that guy was cute and delicious. Many more details and photos will be posted eventually. Peru has a ton more things to do and is definitely on our travel list for a return trip someday. Buenus dias! Checking in from downtown Lima Peru to let the world know that despite aborted airplane landings, pirahnnas, millions of bugs, a visit to a shaman, a wild boa, pounding rain, and lots of local drinks -- we´ve survived a week in the Amazon. And never has an a region of the globe taken so strongly to Larry The Lizard, all the guides, staff, and children on the Amazon loved Larry. Everyone except the monkeys, who live in absolute horror of lovable Larry. We only had to share the jungle lodges with one other couple, Kevin & Lynn, who live 30 minutes from us up in New Hampshire but we had to travel to the Amazon jungle to meet them. Today we catch a flight (maybe?) to Cuzco and spend 4 days in high altitude near Macchu Pichu.